Calculates the power spectrum of a signal that is unevenly spaced in time. The data material at the discrete- and unevenly-spaced times. The discrete- and unevenly-spaced times. The power spectrum, in the sense of the Lomb normalized periodogram. The frequency points at which this node calculates the power spectrum. 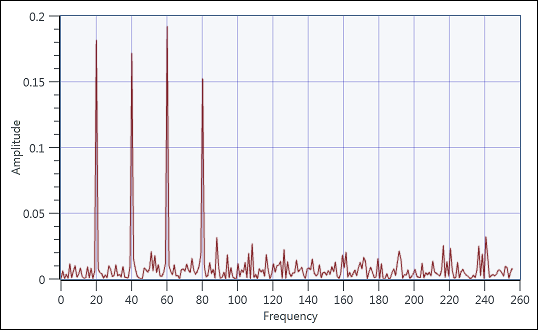 The following diagram shows the spectrum of length 256 of a signal that has been sampled at unequal intervals of time. The signal is a combination of sine waves of frequencies 20, 40, 60, and 80 Hz. The duration of the signal is 1 sec. The sampling frequency was chosen as 256 Hz, giving the frequency resolution of 1 Hz.